Why, you might ask, would someone with her credentials have to deal with rejection? Because our spouses are in the military, and for better or worse it’s hard to maintain our careers. While military spouse unemployment is certainly an issue that is being tackled head-on by groups like America’s Career Force, In Gear Career and Mad Skills, none of their efforts matter unless companies actually hire military spouses. While I’ve been refused a job because the employer said I “was just going to leave,” there is a mountain of evidence that job-hopping is actually good for your career. The other concern I’ve heard from employers is they are worried the military spouse will flake on job responsibilities when his or her active duty spouse is deployed or unavailable. My rebuttal: how is that situation any different from a parent dealing with an unexpectedly ill child or a myriad of other things that interfere with one’s job? Furthermore, it is unacceptable to refuse to hire someone because of their spouse’s career, so while I understand employers’ concerns, perhaps open and honest dialogue is in order during an interview. We have a long way to go when it comes to getting hired into positions that allow us to maintain our careers throughout our active duty spouse’s career, but until then, I am sharing a few things I have learned throughout rejections, relocations, and feeling hopeless. Like many, I am not a fan of networking events. However, most of my jobs as a military spouse were born out of pure networking. The key, like Amanda mentioned above, is focus. You don’t have to attend every event out of fear that you might miss the big opportunity. Instead, choose what you can handle, say one event a month, and make the commitment to attend. While I am against taking any job that comes along for the sake of having a job (unless, of course, you’re honorably providing for your family), if you find a job in your field that might not be what exactly you’re looking for or might even be below your skill set, I say go for it. After you get laser-focused, list your dream job. Then, work backwards to see what skills and experience you need to get there. The biggest lesson I’ve learned on this journey to maintain my career is that it is not linear – it’s all over the place. 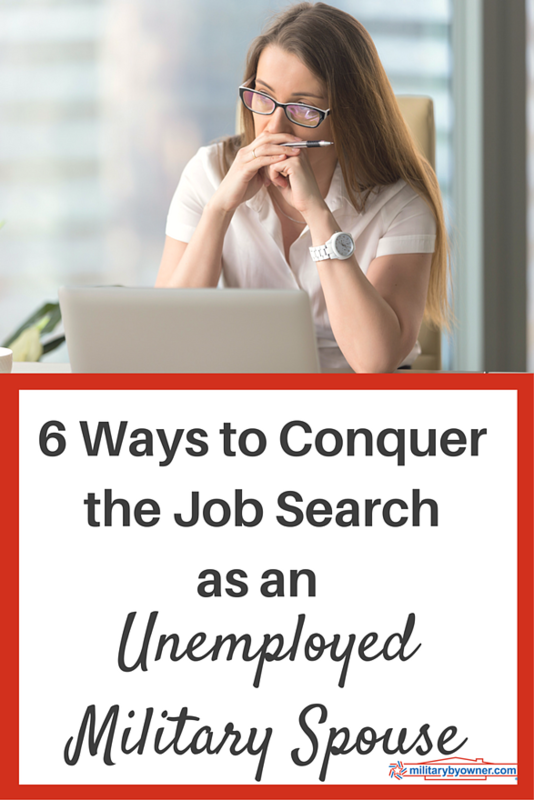 So, you might take a job that is outside of your perceived skill set so you are forced to grow or you could take a position doing grunt work that will fill any gaps in your resume. As long as you stay on your path, that experience is worth it. If you’ve just received your latest rejection email, it feels like a punch to the gut and you may want to quit. You cannot do that. Like a shark, you must keep moving or risk the death of a successful job search. It is after all, a search; a journey, not a destination. It might take longer than you’ve planned, but just keep moving forward and you will eventually land where you are meant to be. We love our acronyms in the military, don’t we? This stands for Stay Ready, Never Gotta Get Ready. How heartbreaking would it be if you landed your dream job, but had let a necessary piece of the puzzle lapse, like a certification or a certain skill? Even if you create a free blog and publish your thoughts on topics within your career field, make sure you are always doing something to advance your skills so you will be prepared when your time comes. We all get burnt out on the journey, so when you feel like you’re drowning, find something you are passionate about and pursue that for a little while. Have you ever wanted to learn cake decorating, knitting, or how to code? Take this time away from your job search to broaden your passions and, you never know, you might not only fall in love with a new hobby, but also find a new career path. It might feel like everyone is ahead of you. When you start to question your skills and abilities, remember that the military only makes up 1% of the U.S. population. We do have a different set of obstacles, but they don’t have to stop us. Remember that this is just one part of your life, and eventually you will no longer be a civilian again. Being a military spouse is not something you can train or prepare for – you just have to jump in, so enjoy the adventure! About the author: Jessica Yost is a Public Relations Consultant who is currently the Social Media Coordinator for Germono Advertising Company. As a certified makeup artist, Jessica also runs a small business, Electra Lane, offering makeup lessons, image branding, and grooming services for professionals. She is involved with several charities, including the Travis Manion Foundation, and serves on the board for the Washington, DC Chapter of the Naval Officers’ Spouses’ Club. Jessica has earned a Bachelor of Science degree in psychology from Towson University and a Master’s in strategic public relations from The George Washington University. Jessica and her active duty Navy husband, Adam, have had six addresses in the last 10 years. They now have two beagles, Clark and Kent, who you can follow on Instagram at @TheSuperBeagles, and currently reside in Alexandria, VA. They enjoy all of the restaurants, as well as human and dog-friendly activities, available in this beautiful city – it is their most favorite duty station yet. In her spare time, Jessica enjoys baking, especially her grandmother-approved chocolate chip cookies, and Barre3 workouts.